If you've ever turned on the TV and seen a charismatic, boyish, conservative looking man yelling at scientists in an animated fashion, there's a good chance it was Marc Morano. Marc's new movie, Climate Hustle, is slated for release during global climate change negotiations next month. As in past years, Marc Morano will be among a contingent of a dying breed of science deniers attending the COP with the simple intention of interference. Having met Marc before, I know what it's like to look into the eyes of someone who is paid to misrepresent truth with confidence, and attack my natural hesitation to call out his dishonestly. Last June, at The Heartland Institute's tenth climate denial conference--a desert of true climate science expertise--I recorded my conversation with Marc. At minute 2:45 in the recording of our talk, he pulls a classic move. Listen to him pull a a double-layered lie, baiting me to confirm that 2014 was the hottest year on record, then attacking me for saying yes. In fact, scientists say that 2014 was the hottest year on record, according to a study by NASA and NOAA, as reported worldwide by BBC, TIME, The New York Times, The Guardian, The Weather Channel. But Marc knows what the Tobacco industry discovered in the early 20th Century: the facts don't matter. Even though I was right, Marc laid into me, seeing an opportunity to reference a controversy that he himself helped fabricate. His intention was to make me question myself, and thus appear uncertain and discredited to anyone reviewing our conversation. The actual content of our conversation matters much less than the aesthetic. As a current showman and former salesman, Marc gets that. To find Marc's weaknesses, an examination of his rapid-fire claims is needed. You hear him say NASA retracted the statement (not true), and claim that AP had to pull down a story. In reality, The AP clarification statement was not a retraction, and it did not reverse the conclusion of the NASA/NOAA study. Nor did it disprove decades of scientific evidence that human-caused climate change is happening, a conclusion Marc hopes to help the audience jump to. If you even bothered to read this far, you see the infuriating advantage that Morano has. A lie, or a half-lie, takes only a few seconds to say. It can take a long time to untangle. By then, Marc has already moved on to his next line - trying to debunk each inaccurate claim as it happens would be a mistake. It would do nothing to clarify the facts to an observer unfamiliar with the science of climate change. That's where long-term documentation comes into play, and that's where Marc Morano's disinformation train loses steam. After decades of financing political groups to attack the science of climate change and the scientists conducting the research, ExxonMobil is embroiled in scandal. This follows revelations from InsideClimate News and the Los Angeles Times that Exxon not only recognized climate change as fact, and its root in fossil fuel use, but spent millions on scientific studies of our global climate system. After Exxon buried the evidence and waged an advertising and public relations campaign to deny the science, the company coordinated and financed several groups to confuse the public. One of these groups is Marc Morano's employer, the Committee For A Constructive Tomorrow, or CFACT, which pays him a $150,000 annual salary. CFACT and Exxon, along with Chevron, coal utility Southern Company and a number of other front groups forged a plan in 1998 at the American Petroleum Institute, a plan they continue to follow in 2015. The "Global Climate Science Communications Action Plan" involved placing scientists who appeared independent at these front groups, financed by coal, oil, car and other industrial corporations to make public relations sound like science to reporters and the public they report to. Morano was at a critical intersection of the strategy: he worked in the office of Senator James Inhofe (R-OK), who remains an outright denier of global warming. Morano's poisonous words are still parroted by Senator Inhofe at every opportunity, who loves to pretend that global warming is disproved every time it snows outside. Morano and Inhofe have capitalized on America's scientific ignorance. While public relations consultants like Morano continue to lie to the public, policymakers like Inhofe are cleared to continue putting polluters before people in Congress, siding with oil and coal companies paying for their elections instead of the people they are elected to represent. Will the Climate Hustler Go Down with ExxonMobil? The future for Marc Morano and the rest of the cast of climate deniers is uncertain. The New York Attorney General issued a subpoena to the oil giant, initiating a process that could eventually implicate people like Marc. Congress and presidential candidates alike already have their eyes on ExxonMobil, which could lead to more unearthed evidence that Exxen knew it was deceiving the public in a false manner. If we bump into Marc in Paris this December, for the next round of global climate negotiations, we'll be sure to ask how he feels about the unfolding lawsuits. Investigators at DeSmog have more on Marc Morano and his upcoming movie, Climate Hustle. Rarely do we meet those who have made careers selling us lies. Consider the oddball doctors who took tobacco money to deny a link between cigarette smoking and cancer, or the handful of scientists who take oil and coal money to discredit global warming science, or the people who have done both. Last week, students in Wisconsin and Michigan stepped up to such an opportunity when CFACT Campus, the student arm of a well-known cabal of fossil fuel apologists, hosted climate change denier Willie Soon at several campus events around the country. Dr. Willie Soon is a Smithsonian Institution astrophysicist paid by Charles Koch, ExxonMobil, the American Petroleum Institute and coal utility Southern Company to write papers dismissing climate change, publish op-eds saying coal pollution won't affect our health, refute the seriousness of ocean acidification, and apparently anything else he can be paid to deny. Dr. Soon has misrepresented himself by repeatedly claiming affiliation with Harvard University and using his credentials as an astrophysicist to make people believe he's a climate expert, and he shows no sign of stopping. Indeed, he told students in Madison, "I am as as qualified as anyone on the planet on this topic." In both Madison, Wisconsin and East Lansing, Michigan, Dr. Soon was caught with his pants down. 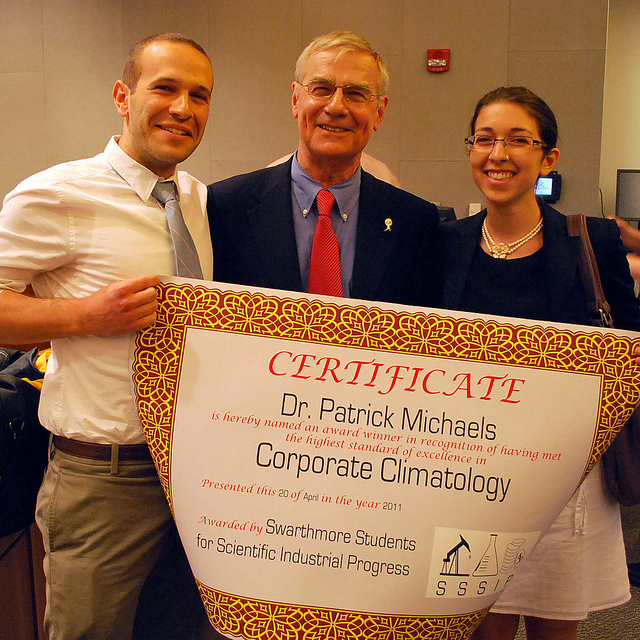 As the Michigan State News documented in its article and accompanying audio interview, Soon claims that all the scientists around the world who study and recognize the seriousness of climate change are motivated by money, yet somehow his funding from coal and oil companies for his extremely marginalized viewpoints doesn't matter. "I have been receiving money from whoever that wants to give me money. I write my scientific proposal. I have received money from ExxonMobil, but ExxonMobil will no longer give me any money for a long time. American Petroleum Institute, anything you wish for, from Southern Company, from all these companies. I write proposal and let them judge whether they will fund me or not, always for a very small amount. If they choose to fund me, I'm happy to receive it." Click to watch (starts @ 1:52). "I was trying to bring down IPCC--is that what you imply?! [...] Let it be known that I do not like IPCC, because IPCC does not stand for science, it is corrupting science." Click to watch (starts @ 3:32). After a question referencing emails with ExxonMobil lobbyists to undermine climate research at the United Nations before it even hit publication, Dr. Soon quickly loses his cool over his record of global warming denial, peppering the student with mild insults before owning up to his actions. Anyone looking at Southern Company's record of pollution and political interference would be skeptical about its commitment to serve humanity. Soon continues with an aggressive rant claiming that the student isn't qualified to question his fossil fuel payments until she stops driving, using electricity, and wearing nylon. 4) Willie Soon states "I don't like to claim that I am an expert on anything," despite listing himself as an "expert in mercury and public health" for a discredited Wall Street Journal op-ed dismissing health concerns over mercury pollution from coal plants. Soon invented similar credentials for another opinion piece in the Washington Times, before he swapped back to being a 22-year veteran of "researching the relationship of solar radiation and the Earth's climate," research Dr. Soon did on the dime of oil and coal companies. Basically, Willie Soon is an expert in whatever problems vested industries will pay him to deny. Michigan State students note how Willie Soon now refutes research indicating adverse impacts from ocean acidification, a global crisis that is married to climate change (both problems stem from humans burning fossil fuels and releasing carbon dioxide into the atmosphere). That's effed up. This man makes a career lying to the public, not to mention our lawmakers, about some of the most serious issues of our time. Climate change is already contributing to the deaths of 400,000 people each year and costing global GDP about $1.2 trillion, according to a report commissioned by multiple nations. 98% of actual climate scientists (a distinction Dr. Willie Soon does not earn) agree that global warming is real and primarily drive by humans burning fossil fuels like coal and oil. "In 2003 Soon said at a US senate hearing that he had "not knowingly been hired by, nor employed by, nor received grants from any organisation that had taken advocacy positions with respect to the Kyoto Protocol or the UN Framework Convention on Climate Change." This is why it's crucial to demand accountability of people like Willie Soon. He is a public relations tool of oil and coal companies, and as a scientist attempting to publish in fields well outside of his expertise, that oil and coal money is crucial to recognize. 2003: An American Petroleum Institute-funded study claiming that the earth's global temperature hasn't risen. Three editors of the publishing journal resigned in protest over low scientific standards demonstrated by publishing Soon's work. 2005: A paper mis-attributing arctic temperature changes to solar variability, a thoroughly debunked notion that was funded by the American Petroleum Institute (API). 2007: A non-peer-reviewed paper refuting concerns over global warming's impact on polar bears, funded by API and the Charles G. Koch Foundation. 2009: A paper building upon Soon's 2005 research attempting to claim the sun is mostly responsible for temperature changes. This work was funded by API, ExxonMobil and Southern Company. 2013: Soon's ongoing "research" funding is now hidden through Donors Trust, a network used by the Kochs and other secretive interests who don't want their financial influence to be traced. Donors Trust is the sole source of almost half of recent budgets for CFACT, which paid for Soon's campus tour. Science majors attending the MSU event didn't agree that Soon's points were particularly valid. See this account from a MSU Greenpeace student activist on PolluterWatch for more details. Image from a USA Today article detailing Willie Soon's at events to confuse the public over climate science. Written by Rachna Pannu. This event was covered in the Michigan State News by Simon Schuster, whose interview with Dr. Willie Soon confirms CFACT paid for Soon to attend these events. Dr. Willie Soon, a well-known climate change denier, was invited by the MSU Campus Conservatives at Michigan State University to talk about climate change. The event was sanctioned by CFACT, an obscure but vocal group among climate science deniers. We at MSU Greenpeace saw this as a great opportunity to have some of our members attend and question the reasons and methods with which he chooses to deny what 98% of climate scientists have agreed to be true. The bulk of Dr. Soon’s talk involved aggressively targeting published or well-known supporters of climate change prevention, including professors, Al Gore, and federal, national and international organizations. He went through the data, attempting to discredit it with conflicting data from other studies and experiments. However, this aspect of his talk left me with more questions than answers, especially since he is a known recipient of oil and coal money. Willie Soon spent a good amount of the talk repeatedly defending himself as an independent scientist simply seeking to learn the truth before anyone had even questioned his motives and his expertise. He ranted that people question his funding and his intentions, but he is just an objective man trying to get to the truth of climate change. He also used this opportunity to criticize the current scientific model of publishing articles in peer-reviewed journals, claiming that it was a buddy-buddy system and peer-reviewing did not affect the validity of the article. Essentially, Dr. Soon was warding off the holes in his credentials before anyone had questioned them because his doctorate is in astrophysics, which is not even related to the Earth’s climate, and has only been able to publish one article on climate science in a peer-reviewed journal. Even that article was hotly debated by the editors, who wrote a negative response and resigned from their positions in outrage. And Willie Soon's funding? It comes from fossil fuel companie--like ExxonMobil and Southern Company--totaling over $1 million in the last decade. Willie Soon pulled up a graph showing the temperature range over a series of years in the 2000’s and asked rhetorically whether anyone could see an increase in the temperatures over time. Yes, I could, but I would rather like to question the validity of using a period of less than 10 years to examine the change in the Earth’s temperature over time. In another example, he showed a graph that analyzed both the variance in amplitude and shift in time for the predictions of temperatures by many different model used by scientists. The models were dispersed around the central point of zero difference in amplitude and zero shift in time, but he simply stated that the image showed errors in all of the models and stated that none of them were in the lower left corner. Why they should be in a region of less amplitude and a negative shift in time in relation to the actual temperature patterns baffles me. Members of MSU Greenpeace questioned Soon about his articles on climate science, and he became aggressive and very defensive, stating that peer-review did not signify greater accuracy (peer-review is crucial to ensuring the highest conduct in scientific research). When a member of The State News, the MSU student newspaper, asked why with about 13,900 published articles on the verity of climate change and only twenty-something that argue the reverse he felt that climate change did not exist, Dr. Soon again became frustrated. Soon referred to a quote from Albert Einstein, saying that it only takes one person to disprove what everyone agrees upon. Read coverage of this event from the State News here. There was no way to have an effective discourse about climate change with Dr. Willie Soon because he refused to accept the very basic premises of our current scientific standards that peer-review ensures accuracy of the published articles and that a large consensus by educated individuals who have done their own research into a matter indicates the verity of the hypothesis. In addition, some of the data and sources he provided seemed either not applicable or reputable as we are taught is critical to reliable scientific research. Separate from Willie Soon’s questionable assertions about global temperature trends were his assertions used to dismiss ocean acidification, a serious problem that is linked with increasing carbon dioxide in our atmosphere (caused by companies funding Dr. Soon, like ExxonMobil and Southern Company). Soon's sources were shaky--data cited from a BlogSpot website, for instance, not exactly a credentialed scientific institution. He disputed a report by a marine biologist that claims increasing CO2 content of the ocean results in weakening of the shells of marine organisms by interfering with their ability to use calcium carbonate in their shells. Scientists who are serious about scientific standards tell us that ocean acidification is having a profound impact on coral reefs (they are dying rapidly), and scientists are working to determine if more acidic oceans are impacting crustaceans, ocean animals that have shells. Dr. Soon apparently already has the answers, stating that crabs and lobster shells were not composed of significant amounts of calcium carbonate, and then he provided data that showed lobsters and crabs increasing in size after carbon dioxide was bubbled through their water. If indeed the shells of crustaceans are not mainly composed of calcium carbonate, how does an experiment showing the effect of carbon dioxide presence in the water of lobster and crabs conflict with the statement that it affects the availability of calcium carbonate? The only thing I can say is that I felt some relief in that he was only able to attempt to influence a half-filled classroom composed of 1/3 individuals who did not attend the university and already believed in Soon’s paranoid vision of the world and 1/3 supporters of the movement to protect our planet. There are always a few doubters, a few critics and a few conspiracy theorists that refuse to acknowledge global warming no matter how much evidence is presented to them. If we can get the majority of rational individuals to understand the changes occurring to the environment, we can create change to save our planet and make it a healthier place to live. Senior, Biochemistry and Molecular Biology B.S. I was just getting out of class last Tuesday when Dan Cannon, Greenpeace Student Network Coordinator, called to inform me that Dr. Willie Soon was coming to University of Wisconsin-Madison the following night to “challenge the Global Warming status quo.” I attend school an hour away, but I just couldn’t allow myself to pass this opportunity up. I had prior knowledge that there are climate deniers that are funded from Big Coal and Big Oil, but what I learned about Willie Soon's funding, motives, works published, and past (and present) controversies shocked me. “Harvard Astrophysicist Dr. Willie Soon,” as listed on the fossil-fuel funded Collegians For A Constructive Tomorrow’s event notification, consistently misrepresents himself to seem credible. Dr. Soon is not employed by Harvard University as suggested by CFACT Campus, but he uses the affiliation with the university to his advantage. He works for the Harvard-Smithsonian Center for Astrophysics. Though located on Harvard’s campus, the group is not officially associated with the University, and Harvard University has distanced itself from Soon. He is an astrophysicist by training, but has no formal education on climate science. His self-misrepresentation alone wouldn’t be jaw-dropping, but when paired with information about Willie Soon’s funding, it is clear that something fishy is going on here. The last grant he received from a funder with no ties to dirty energy interests was in 2002 (a grant that carried through to 2006). Since then, he has been entirely funded by fossil fuel interests. Dr. Soon has received over $1 million in coal, oil and gas funding for his work, including funding from Southern Company, the American Petroleum Institute, ExxonMobil, Texaco (now Chevron), and the Koch Brothers. Greenpeace Freedom Of Information Act inquiries to Smithsonian Institute reveal that in 2011 and 2012, Dr. Soon received nearly $115,000 from Donors Trust. He has been caught directly coordinating with lobbyists from ExxonMobil to undermine the United Nation’s latest Intergovernmental Panel on Climate Change (IPCC) report before it was even released. IPCC is the global research authority on climate change. When the time came to leave Milwaukee for CFACT's event in Madison, Lynda Mouledoux and I probably had over 100 different species of butterflies in our stomachs. I’m just a college student, but this was my chance to demand accountability from someone meddling with important science in order to hold the world back from addressing climate change. After his presentation, he held a question and answer session. I came prepared to ask critical questions. During the questioning, something must’ve gotten under his skin and caused an aggressive and defensive posture that launched phrases like “childish,” “extremely rude,” “wrong,” and “if you had a bit of intelligence” Not once did I use a personal attack on him; I was simply asking him about factual details of his career and those funding it. My ask was "You have received over one million dollars in funds from coal and oil interests. The last grant you received from a funder with no ties to the energy industry was in 2002. That's over a decade ago. So Dr. Soon, why should we trust someone without credentials in climate science whose work is only funded by coal and oil interests?” Watch the video below to see his reaction to this question. "I don't like to claim that I am an expert on anything, but I have enough knowledge about climate science and climate system to be able to write scientific papers and go to meetings and talk about monsoon systems and talk about any other things that you want to discuss about climate science issues. I'm as qualified as anybody that you know on this planet on this topic"
Mr. Soon, a natural scientist at Harvard, is an expert on mercury and public health issues. ...except Soon doesn’t work for Harvard and carries no formal expertise on “mercury and public health issues.” Co-authoring that article was Paul Driessen, another known fossil fuel shill from the Committee For A Constructive Tomorrow (CFACT)--the parent organization to the campus group hosting Soon’s discussion on climate science. We’re living in a time where corporations and junk science are crippling the effectiveness of our own government to serve us. According to Bill McKibben, founder of 350.org, “ExxonMobil made more money each of the last three years than any company in the history of money.” Corporations put profits over people and destroy the earth to please shareholders. I refuse to accept this, so I will continue to perform Non-violent Direct Action in order to do my best to change the status quo. This blog was written by Hannah Noll. Hannah is a sophomore at University of Wisconsin-Milwaukee, a Campus Coordinator with the Greenpeace Student Network, and a Greenpeace Semester alumna. A new Greenpeace analysis released today shows that Donors Trust, a shadowy funding vehicle, has laundered $146 million in climate denial funding from 2002 to 2011. Yesterday’s article in the Guardian referenced part of the Greenpeace analysis. Today’s report is now up to date with the latest available funding from 2011. In addition, a Center for Public Integrity report released yesterday illustrates the efforts of Donors Trust to set up conservative media megaphones in state capitals. Today, the Guardian reported that these ideological media outlets have been instrumental in anti-climate fights at the state level. These include state and regional attacks against wind power, solar power, and carbon pollution reduction programs. As climate denial funding from traceable Big Oil sources like Exxon and the Koch brothers is declining, the anonymous money funneled through Donors Trust is skyrocketing. Donors Trust and its associated organization, Donors Capital Fund, have funded 102 climate-denial organizations since 2002. From 2002 to 2011, Donors Trust and Donors Capital Fund have provided $146 million to climate denial groups. Additional climate denial organizations that have received major funding in recent years by Donors Trust include the Heartland Institute, Competitive Enterprise Institute, Cato Institute and the James Partnership (Cornwall Alliance). Wait, so what is Donors Trust, exactly? It’s a shadowy funding operation for anti-government extremists and climate deniers. The mission of Donors Trust is to provide ultra-conservative funders a way to support their controversial pet-causes without leaving fingerprints on the grants. Who is behind this untraceable money? It’s impossible to track all of the big-pockets hiding behind Donors Trust. One notable individual is Charles Koch, the secretive oil billionaire who was discovered to have funneled $8 million through Donors Trust from two of his foundations. And that’s only the amount that we can track – we don’t know the full extent of the Koch’s account with Donors Trust. The deep dependence on Donors Trust by climate deniers goes far beyond the Heartland Institute. Marc Morano’s organization, the Committee for a Constructive Tomorrow, has received between 40% and 46% of its budget through Donors Trust in recent years. Morano was named 2012 “Climate Misinformer of the Year,” often found as a talking head on Fox News or CNN denying that human activity is affecting the climate. In response to the President’s 2013 State of the Union address, Morano published a point by point rebuttal to the section on climate change. CFACT is among over a dozen organizations that get 30% to 70% of their total budgets from Donors Trust and Donors Capital Fund. Other noteworthy groups include Americans for Prosperity Foundation, the Cornwall Alliance (James Partnership), and the State Policy Network. For those familiar with the effort of ExxonMobil and the Koch brothers to bankroll a network of organizations denying basic climate science, a new article in the Guardian offers some revelatory information on the secret funding network that outweighs even top denier sugar daddies like Koch and Exxon. Donors Trust and Donors Capital Fund, based out of the DC suburb of Alexandria, VA, have sent $118 million to the 'climate denial machine' from 2002-2010, according to a Greenpeace analysis featured in the Guardian. The graph above, from the article, illustrates the significance of this money as compared to giants like Koch and Exxon. Of course, the Koch brothers are part of the Donors Trust network, using the DONORS groups to hide their own giving to a variety of corporate front groups. Because of the obscurity provided by DONORS, we don't know exactly who is getting exactly how much of the Koch payments to Donors Trust and Donors Capital Fund. An accompanying article by the Guardian shows how the DONORS groups provide large portions of organisations' entire budgets, such as the Committee For A Constructive Tomorrow, which even among climate deniers is notably anti-scientific. The support helped the Committee for a Constructive Tomorrow (Cfact), expand from $600,000 to $3m annual operation. In 2010, Cfact received nearly half of its budget from those anonymous donors, the records show. The group's most visible product is the website, Climate Depot, a contrarian news source run by Marc Morano. Climate Depot sees itself as the rapid reaction force of the anti-climate cause. On the morning after Obama's state of the union address, Morano put out a point by point rebuttal to the section on climate change. Americans For Prosperity Foundation got $7.6 million from DONORS groups in 2010, 43% of its budget. AFP Foundation is chaired by David Koch and has received millions in direct funding from Koch foundations since the Koch brothers founded it. Committee For A Constructive Tomorrow (CFACT) got $1.3 million from DONORS in 2010, 45% of its budget. Cornwall Alliance (through the James Partnership) got $339,500 from DONORS in 2010, 75% of its budget. Heartland Institute got $1.6 million from DONORS in 2010, 27% of it's budget, which came from Chicago billionaire Barre Seid (see p. 67). State Policy Network got 36% of its 2010 budget ($4.8 million) from DONORS. SPN members include just about every climate-denying organization and every conservative think tank in the country, including AFP and Heartland. Koch is clearly embarrassed by the negative publicity (see press roundup below). Koch "Facts," the company's PR website that lashes back at unfavorable reporting on Koch, attempted to respond to the flood of press on the DONORS groups without mentioning them by name. Similarly, Donors Trust president Whitney Ball has done her best to keep Donors Trust and Koch from being synonymous. To be clear--they are not, but the Kochs and their operatives are key players in the Donors network, with people like Arthur Brooks of the American Enterprise Institute and Steven Hayward of the Pacific Research Institute helping oversee DONORS operations, including millions in funding to their own organizations. Earlier this year internal documents from the Heartland Institute, a major hub of climate change denial and right-wing extremism, were publicly leaked. The documents exposed the Heartland Institute's funders and strategies for attacking climate science, and led to a mass exodus of Heartland's corporate funders. Today, a newly updated report based in large part on Heartland's internal documents has revealed two new insights into the way in which the anti-climate science movement has been supported and financed over the last decade. A billionaire named Barre Seid is the Heartland Institute's main sugar daddy. He is the "Anonymous Donor" listed in Heartland's fundraising plan who finances climate science denial operations to confuse children, the general public and policymakers over global warming. Seid has been the biggest booster behind Heartland's attacks on climate science, donating millions of dollars to keep the Heartland Institute's anti-science work afloat. The Koch brothers and other ultra-wealthy industrial ideologues are now hiding much of their donations to conservative political outlets through an obscure group of foundations that specialize in secrecy. In total over $311 million has been put through twin organizations known as Donors Trust and Donors Capital Fund which share an address in Alexandria, Virginia. The people running these organizations are close to the Kochs and have numerous ties to the groups that the DONORS network funds, such as the Koch-founded Cato Institute, the Heritage Foundation, the Independent Women's Forum and the Manhattan Institute. The Kochs have a little-known foundation that only donates to these "DONORS" groups called the Knowledge & Progress Fund, according to the report detailing this network. The report, written by a silicon Valley scientist turned public interest watchdog John Mashey, is titled "Fakexperts," and details how right-wing foundations associated with the Koch brothers, Richard Mellon Scaife, the Bradley family, and others have been using a secret finance network to support extremist right-wing groups. Most of these groups are associated with the State Policy Network, a band of corporate apologists who have made careers denying everything from the dangers of smoking cigarettes to the existence of climate change. "...if a donor names his child a successor advisor, and she wants to give to Greenpeace, we’re not going to be able to do that." Expect to hear more about Donor's Trust and Donor's Capital Fund as we continue to track the dirty money of Koch Industries and their allies. For more, check out PBS FRONTLINE's recent dig on climate deniers in a special called Climate of Doubt, which includes descriptions of the DONORS groups from Drexel University's Robert Brulle. 4 a.m. Bali, December 2007, the first Tuesday of the two-week United Nations climate talks. My phone rings, waking me up. Blearily, and a little crossly, I answer it. I was in Bali to run Greenpeace International’s media for the meeting. The caller was someone called “John” who said he was an intern for a US NGO that I had never heard of. It was a small NGO, he said, who couldn’t come to the meeting, but “john” asked me for a copy of the UN Framework Convention on Climate Change’s media list for the meeting. I confirmed I had a copy but refused to give it to him – he appeared a little suspect. The conversation ended when I put the phone down – the caller clearly wasn’t bothered that he had woken me at 4 am, which was odd, as an NGO colleague would have apologised and hung up immediately. Three days later I was again woken by the phone, with the information that the right wing think tank the Heartland Institute had just www.reuters.com/article/2007/12/06/idUS230399+06-Dec-2007+PRN20071206">http://www.reuters.com/article/2007/12/06/idUS230399+06-Dec-2007+PRN2007...">issued a press release slamming the UN for working with environmental NGO’s. Heartland’s press release posted a link to a recording of the 4 a.m. conversation earlier in the week. – called me at 4 am, lied to me saying they were an intern for a US environmental NGO - recorded that conversation without my knowledge or my permission, and released the audio of the telephone conversation to the media, again without my permission. This calls into question Heartland’s bleatings about being misled by climate scientist Peter Gleick, and its threats to sue him for using false credentials to obtain information. They seem happy to use underhand tactics to get information for themselves, yet slam Gleick for doing similar. CEO Joseph Bast called it a http://heartland.org/press-releases/2012/02/20/statement-heartland-insti...">“serious crime”. To recap, the Heartland Institute used a false organizational identity in order to obtain an internal document. It also surreptitiously recorded a telephone conversation (illegally, I believe, if it was done from your home state of Illinois) then posted it online to attack me in the same sort of privacy invasion you’ve been complaining about. Does any of this sound familiar? It should, not only because your organization did all this, but it recorded itself doing exactly what you’ve been howling about was done to you. I’m calling on you to show the same level of post-action forthrightness of Dr. Gleick, admit what you did, and re-post the audiotape of the full conversation. I haven’t yet heard back from Bast. DeSmogBlog has http://desmogblog.com/heartland-double-standard-institute-tried-scam-gre...">more examples of Heartland’s history of deception, including leading someone to believe that a video they were being interviewed for was for the Discovery Channel rather than a climate denial video. Given my first-hand experience of Heartland, and having also witnessed the theft of thousands of emails between climate scientists and Heartland’s thousands of words about them (often willfully taking them out of context) in Climategate, I find it breathtaking that Heartland has suddenly become all ethical about the leaks of its documents. These are documents that show plans to mislead children about the science of one of the most important issues in their future: climate change. Also attending the Bali meeting was the right wing think tank, the www.cfact.org/a/1194/Special-report-from-UN-climate-conference-in-Bali">http://www.cfact.org/a/1194/Special-report-from-UN-climate-conference-in...">Committee for a Constructive Tomorrow (CFACT), that had brought its crack team of climate deniers, including Lord Christopher Monckton, whom I’d seen hectoring journalists in the media centre. Monckon was registered on the CFACT delegation but the UN media list itself confirms Monckton’s attempts to register himself as a journalist, listing his email contact as Tom Swiss (Heartland’s PR man), as with another denier, Will Alexander, whose email contact was another Heartland email address. CFACT has received a total ofwww.desmogblog.com/denial-a-palooza-round-6">http://www.desmogblog.com/denial-a-palooza-round-6"> $2,509,285 from fossil fuel funders ExxonMobil, the Koch Foundations and the Scaife Foundations since 1998. We now know that Heartland had http://hot-topic.co.nz/puppets-on-a-string-us-think-tank-funds-nz-sceptics/">paid for a number of the deniers who were part of the CFACT team. Heartland money went to the New Zealand Climate Science Coalition that year, and NZCSC members, Owen McShane, Bryan Leyland and Vincent Gray were also on the CFACT team, along with a number of Australian deniers, Prof Robert (Bob) Carter, David Evans and Joanne Nova. Desperate for the attention they weren’t getting, CFACT even offered free Balinese massages to people who attended their event. Why didn’t I sue Heartland at the time? Simple: they would have loved the attention – and I had better things to do with my time, as the 192 governments who had already accepted the science of climate change worked towards agreeing the Bali Mandate. As it was, no media covered Heartland’s outraged press release and the whole incident served as an opportunity for me to talk in detail to a number of journalists about the climate denial industry and its funding by the fossil fuel industry. My one failing is that I cannot recall the name of the NGO that the caller pretended to be an intern for. I didn’t write it down at 4 am and, given that I’m not from the US, I didn’t recognize the name the caller gave me. But he definitely didn’t tell me he was from – or acting on behalf of - the Heartland Institute. And given that I am one of the co-founders of Greenpeace’s www.exxonsecrets.org/">http://www.exxonsecrets.org/">Exxonsecrets website, launched in 2004 to track money going from ExxonMobil to think tanks including the Heartland Institute for their campaign to promote climate denial, every alarm bell would have gone off if I’d received a telephone call from The Heartland Institute, no matter what time of day or night it was. I knew this organization and its peddling of climate denial very well. I would certainly have remembered if they said they were taping the call, let alone agreed to that – and its subsequent broadcast.